LBS Centre B.Sc Nursing first allotment 2014 result will be published on 19th July at the official website. LBS Centre for Science and Technology will publish the first allotment for Kerala Nursing BPT, MLT, B.Sc Perfusion technology, B Sc (Optometry), BASLP, BVT, B Pharm and D Pharm courses. Candidates who had applied for the Kerala nursing 2014 can check the allotment status on 19th July through the portal www.lbscentre.in. LBS Centre for Science and Technology will publish the first allotment for B.Sc Nursing courses for the academic year 2014 – 15. The first allotment of various nursing courses like BPT, MLT, B.Sc Perfusion technology, B Sc (Optometry), BASLP, BVT, B Pharm, D Pharm courses will get published at the official website of LBS on 19th July 2014. Candidates who had applied for the Kerala nursing 2014 are advised to check their allotment status on 19th after it get published at the portal www.lbscentre.in. The trial Allotment and Rank list based on the options filed up to 14.07.2014 got published in the website. This single window system admission procedure is made to find suitable candidates for the professional courses in Nursing, Pharmacy, and Paramedical streams. Options can be registered for newly added colleges also at the same time the College/Course option Registration should be completed before 12 PM of 18th July 2014. The trial allotment reveals only the possibility of getting an allotment. There is no guarantee that the results of the trial allotment will be retained in the first allotment. Applicants who find their names in the first allotment should have to remit the prescribed fee in any one of the branches of Federal Bank on 21st or 22nd July 2014. Those who fail to pay the fee on time will lose their current allotment as well as the eligibility for further allotments. They have rare chance to get admission except for spot allotment. A total of 115 nursing colleges spread across the state which is run by the government colleges and private institutions. Nursing colleges which falls under various Universities are also listed in the prospectus. The allotted seats for various courses in each Nursing colleges range from 40 – 60. Students need to read the press releases and other notification provided in the LBS website to get updates about the allotment. 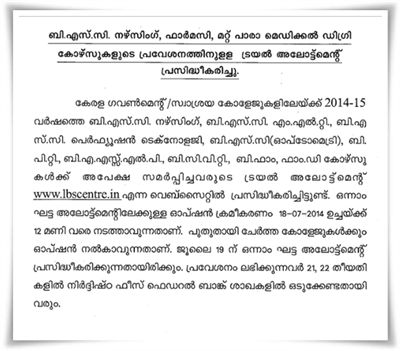 LBS Centre Kerala B.Sc Nursing trial allotment 2014 and rank list will be published today (17th July 2014) at the official website. LBS Centre for Science and Technology will publish the allotment for Kerala Nursing BPT, MLT, B.Sc Perfusion technology, B Sc (Optometry), BASLP, BVT, B Pharm, D Pharm courses. Candidates who had applied for the Kerala nursing 2014 can check the allotment status through the portal www.lbscentre.in.